Norwegian Cruise Lines has been working on their latest project in Belize, a private island just three miles off the Belize coast right by Placencia Village. Their multi-million dollar remodel of Harvest Caye, will turn this tiny island into a cruise ship landing location for their cruises. This will be the first port in Belize that can accommodate a cruise ship actually pulling up to a pier to unload guests, from where they will be able to frolic at the Disneylandesque island facilities or take shuttles to the Placencia mainland to go out on land based tours or snorkeling to the relatively nearby Belize Barrier Reef. 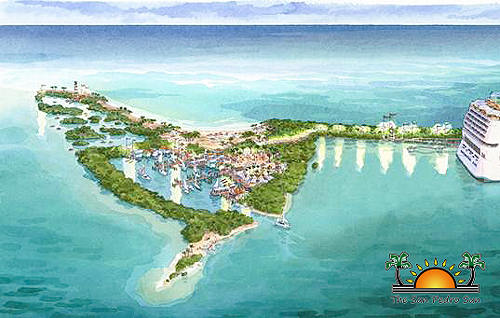 Harvest Caye will have brand new manufactured beaches, a marina for shuttle boats, and water sport activities for cruise ship guests. From internet research, we believe the first ship to dock on Harvest Caye will be the Norwegian Pearl, arriving in Belize on October 26, 2015. It looks like the schedule will ramp up to 3 or 4 ships/week, all in the fleet of Norwegian, which secured a Belize government contract for exclusive access to southern Belize. 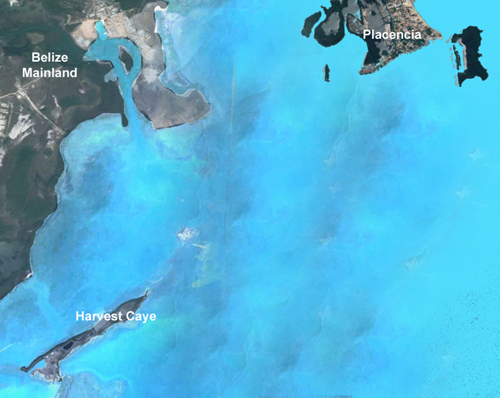 Harvest Caye is only 3 miles from Placencia. This image is of Harvest Caye prior to remodeling it into a cruise ship port. There has been a lot of controversy over the development of this island. Cruise ships have never been able to access the southern part of Belize, and now there will be thousands of tourists (each ship carries about 2400 guests and 1100 crew) inundating Placencia, increased bus traffic for land tours, overwhelming every restaurant, bar, and gift shop, which will all dramatically change the nature of the town. Placencia has developed as a tourist destination featuring a quiet, laid back, true “Belizean’ atmosphere, and now this will be lost with the huge crowds of cruise ship tourists arriving in town. Many environmental concerns were raised over the impact the development of this island would have on the surrounding reefs and water quality, not to mention the nearby Mayan ruins of Nim Li Punit and Lubaantun; but the approvals were given by the government despite resounding local opposition. For more information on the unsuccessful grassroots effort to stop the plan, visit southernbelizecruise.org. Placencia is already a popular tourist destination, with close to 50 hotels and lodges on the peninsula. In recent years, private home construction for (mostly) expat Americans has exploded. We feel badly for the locals as well as the new permanent arrivals. We live in a tourist town ourselves, and every local I talk to feels that Moab has been over-promoted. Such will be the case with southern Belize. We are grateful that this inundation of the big ships will not affect our island out at Glover’s Reef. Although our island is longer than a cruise ship, these Norwegian ships would tower over our island, housing almost 2500 guests, while our maximum on any given week is 34. I have long been curious about the size of our island compared to one of these ships, and for this blog post I took the time to figure it out. Our island is about 1/3 a mile long (1760 feet), and although the ships that will visit Harvest Caye are not the largest cruise ships in the world, they are plenty big (965 feet long). What a cruise ship would look like docked at our island, Long Caye at Glover’s Reef. ← Big SUP: New island sport!